I asked this recently of a former student become a friend as we were sitting together in my office. She was catching me up on her previous semester, specifically an interesting class on the history of science. “Sounds interesting. Did you learn about eugenics?” I ask. This question has been present on my mind as soon as she started talking about the course. Maybe it was growing up Jewish that made me particularly attentive to this question, or maybe it was my education in ethics. Either way, it felt like an important thing to learn about in a course purportedly training our future scientists about their historical roots. helping her learn to think about how blunders like these might inform the way she works as a practicing scientist who will also be faced with tough, important ethical decisions. And my student’s story reminded to consider other missed opportunities – whether ours in higher education generally, or my own in the classes I teach. Of course, my student’s ignorance of some of the most tragic blunders in scientific history is concerning. At the same time, she’s a top-notch student, destined for social and academic success, wherever her life takes her. I worry less about her because her education has included learning about racism, sexism, and other manifestations of the way our society systematically gives and withholds opportunities, the ways it – sometimes loudly, sometimes quietly – endangers the lives of those not straight, male, white, able-bodied, middle or upper class. Overall, she has learned to think critically, to analyze situations from several different perspectives and to know how to intervene in situations she feels are unethical or unjust. But learning how to think in this way cannot be limited to a few classrooms on campus. I think, if we are to be effective in training skilled, competent professionals and citizens, this kind of thinking needs to be integrated into all our classrooms. I wish I could say I thought omissions like the ones I describe at the opening were a fluke, that perhaps this class was poorly orchestrated, and that most history of science courses around the country made sure students got a full history–the amazing, life-giving, revolutionizing breakthroughs, and horrifying missteps all included. But I don’t think it’s true. I think, in most disciplines I’ve encountered, I’ve noticed this same tendency to avoid the difficult stories, past and present. My own discipline, social work, is guilty of the same kinds of omissions. For example, we often cite the atrocious Indian Adoption Project, where Native children were taken from their parents and “adopted” into white families. However, we often fail to mention that one of our profession’s heroines, Jane Addams, was most heavily repressed and critiqued by other social workers. In other words, we tend to talk selectively about our mistakes. Especially, the mistakes that challenge the stories we like to tell about ourselves now, in the present day – in our textbooks and classrooms, are often swept under the rug. I think, in a general sense, that this is a very successful attempt to pretend that we are in control. If we can admit that we made some mistakes in the past (usually due to the fault of people outside of our profession–as in the house arrest of Galileo), we don’t have to talk about the really nasty blunders and missteps, and we can effectively pretend like we had very little to do with them. And, as I hope to show below, what’s worse than erasing parts of history is the danger of never learning how to make better, more ethical decisions in the present. This danger was highlighted by educator Herb Kohl in an essay (now a book) about how we teach the history of Rosa Parks in school. His conclusion is that, as teachers and textbook writers, we effectively nullify her as a political presence. 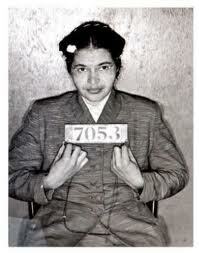 We tend to tell the story of Rosa Parks, the tired old lady whose refusal to move started a revolution. In truth, Rosa Parks was a brave community activist, community organizer and trainer in non-violent resistance: By removing her development as an activist and the intentionality behind her decision to stay in her seat on that bus in 1955, we deny the power of ordinary people to do extraordinary things. To intentionally make extraordinary decisions. To care about something enough to take risks and to challenge authority – even if it stands outside of what’s “acceptable” in the current context (historical moments of civil disobedience were never acceptable by law or society). Further, we mask that courage, risk-taking, and a belief in justice are the kinds of things that we need to learn. 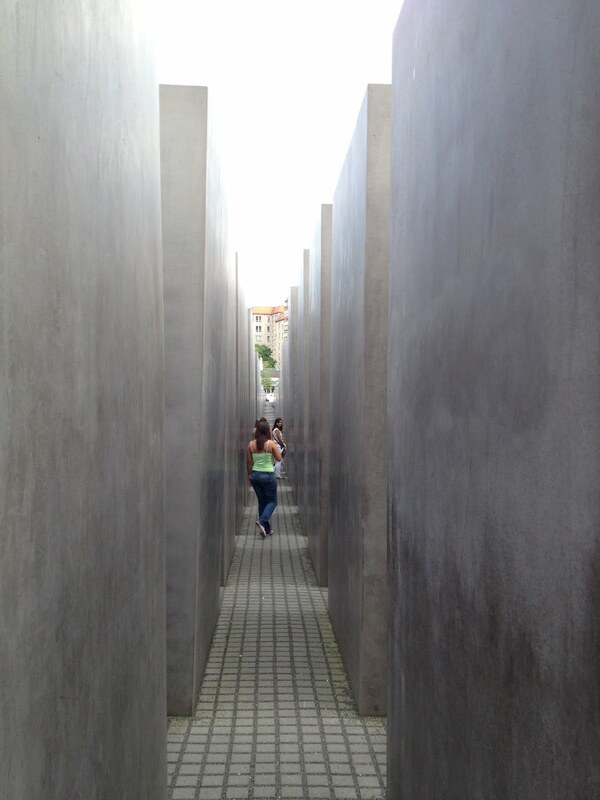 I was reminded recently of my conversation with my former student when I visited the Memorial to the Murdered Jews of Europe in Berlin. The memorial was wonderfully done. I began walking through it and quickly lost track of my traveling companions. I walked up and down the hilly stone ground, hands outstretched, lightly brushing both sides of the grave-like pillars to either side of me. Everything else disappeared as I walked for a while, turned, and walked down another row of pillars. The pillars pulled me slowly, graciously out of intellectual conversations from the moments before and into a steady stream of tears. Eventually we drifted away from the memorial. 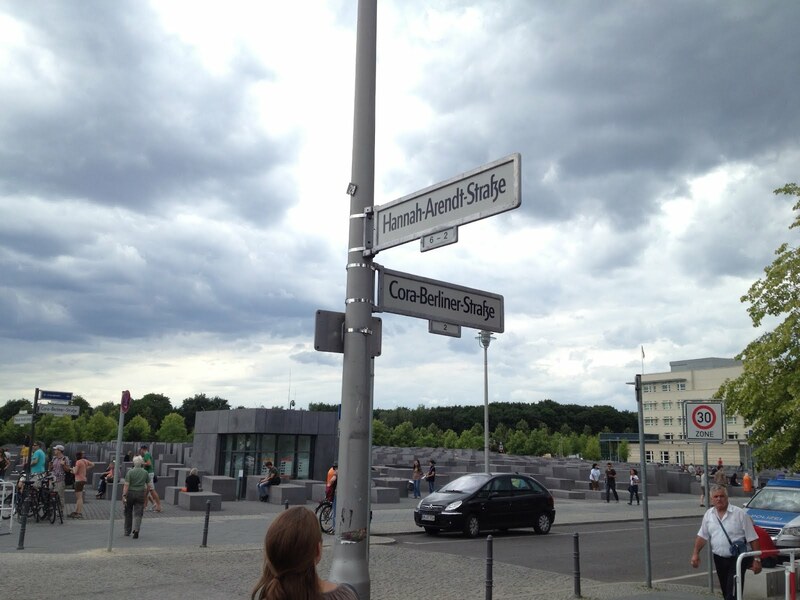 As we walked away, I noticed that the memorial-bordering street we were walking on was called Hannah-Arendt Straße. Hannah Arendt – who survived the Holocaust and became a philosopher famous for examining the conditions under which the Holocaust was made possible in Eichmann in Jerusalem – has a street named after her bordering the Holocaust memorial. At first glance, this makes a great deal of sense, given the broad topic of her research, but at least in my interpretation, it appeared to be an oxymoron. Hannah Arendt’s philosophical work was focused on how something like the Holocaust could occur, and how it could be prevented from occurring again. Her conclusion, in brief, directly contradicts the commonly held belief that we study history in order to prevent ourselves from repeating the same mistakes over and over. Were this maxim true, continuing to bring history into our public consciousness might help us avoid falling into situations like the Holocaust. However, Arendt believed that studying history would likely make no difference were an individual in Nazi Germany faced with the decision of resisting Hitler’s regime or going along for the ride. The only thing that would truly make a difference is if people were able to think, in the moment; to reflect on their actions and make decisions for themselves. If we believe Arendt, the main problem with ignoring the hard parts of our disciplinary histories is not that we forget our history. That is a problem. But the bigger problem is that if we pretend that major decisions weren’t made along the way by ordinary, local, everyday people, and instead read history only as the unfolding of the events that eventually occurred, we forget that we still have to and will have to make decisions. And here I mean ethical decisions. Every day, as a scientist, as a social worker – no matter what discipline we enter – we will be confronted with major ethical decisions. As scientists we need to know how to make these decisions. We will need to know when to let something go, when to stand and fight, or when to pick up and leave. And we don’t just get that ability from nowhere (even though we seem to believe we acquire it everywhere else but our classrooms). We have to develop it. What is possible when we think about what our students are learning? As Lisa Delpit writes in her book OtherPeople’sChildren: “Seldom are students encouraged to tackle the deep moral issues they must tussle with in this complex time, nor are they led to think about themselves as agents responsible for a larger world” (Delpit, Loc 141). I’d like to suggest that, as educators, we need to make it possible for our students to tackle the deep moral issues that shape their lives and work. To do so, they need to know that they are and will be faced these kinds of decisions all the time. They must also think of themselves as people able to affect change in the world, as people who regularly make decisions that matter. I am the survivor of a concentration camp. Women and babies shot and burned by high school and college graduates. I believe that the future of the world depends as much on how we teach our histories as on the history we teach. On one hand, we can teach history as a series of events that occurred in sequential order, leading to the world we inhabit today. I believe this is what we do in most of our classrooms. On the other hand, we can make history available to our students in such a way that they understand the real decisions that have to be made, the decisions that will mean real things in the lives of real people. They will understand the complex and persistent pressures that lead to terrible decisions, as well as the courage and commitment that everyday individuals took to battle injustice. Moreover, they will know how to think, first in our discipline, and then as citizens of a broader world in which we are all responsible for the injustices perpetrated on others. Finally, I think we and our students need to see ourselves as change agents, responsible for taking courageous action to improve the world we inhabit together. There are some broader changes that need to take place. As educators, in general, I believe we need to start making the details of our disciplinary and cultural histories readily available to our students. Especially the ones that are difficult to discuss, that make us feel vulnerable, that involve admitting mistakes. I think we need to change our textbooks so that they tell our histories in a way that opens up for analysis the difficult decisions our predecessors had to make. In the very least, we can change what we teach as individual instructors or departments, making our histories more rich and complex. I also believe that we can supplement these histories with alternate histories, with stories in which people made decisions that took courage, that were resistant to injustice. Telling the real story of Rosa Parks, for example, offers a different model that students can actively choose to follow. I think we can make changes in our individual classrooms as well. If we are paying attention to what are students are learning (rather than what we are teaching), we can push toward the types of learning that involve analysis and synthesis, rather than only knowledge and understanding. We can bring complexity and ambiguity into our classrooms so that our students learn how to deal with it in climate that supports risk in thinking and reflecting before they enter future lives and careers. We can get students outside of our classes and into the community (as in service-learning or courses that maintain community partnerships) where they can see their textbooks in action real, meaningful, and complex ways. Returning to my conversation with my student. My response was probably only the beginning of what an effective learning moment could have been. I took the first step of making the complexities of our general scientific history available to her. But had I been paying more attention, I could have also shared stories about people who made courageous decisions in those historical circumstances. I could have presented an alternate model for dealing with her discipline’s history. We could have reflected on experiences from her life that inform the way she makes difficult decisions. I believe that these are the kind of changes we need to make – in our practice as educators and in our broader education system – if we want to create a society that can think more clearly about the complex ethical decisions of our time. If we do, we will be more prepared to respond with courage to acts of injustice. And that would be a very different society than the one I think we are creating now. Arendt, Hannah. (2006). Eichmann in Jerusalem: A Report on the Banality of Evil. New York, NY: Penguin Classics. Delpit, Lisa. (2006). Other People’s Children: Cultural Conflict in the Classroom. New York, NY: The New Press. Kohl, Herb. (2007). She Would Not Be Moved: How We Tell the Story of Rosa Parks and the Montgomery Bus Boycott. New York, NY: The New Press.